Potatoes, onions and garlic are a necessity in a busy kitchen. Store them properly so you don't lose their valuable seasoning potential or compromise their texture. Improper storage can also cause them to rot more quickly, meaning more trips to the store and frustration on your part. Potatoes need coolness and dim lighting for long-term storage. Wet or moist environments aren't good for them either, as it encourages rot. The refrigerator is too cold and results in oddly sweet, overly brown potatoes when cooked. Go for a space that's more like 45 to 50 F. A pantry, old-fashioned root cellar or cupboard provide solid options. Place them in a dry cardboard box or brown paper bag to keep light away. Keep them away from onions, which emit gases that speed ripening and encourage the potatoes to sprout. 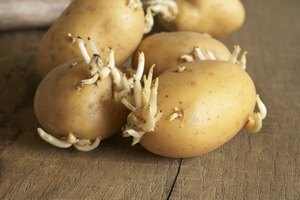 Even if you've stored potatoes correctly, small sprouts may develop. Just remove them with the tip of a knife before cooking. 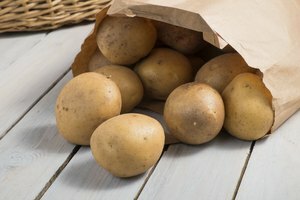 Only put potatoes into long-term storage when they are thoroughly dry. Never wash them before storage. 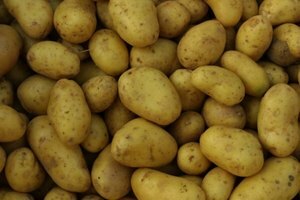 Potatoes with thicker skin, such as Russet, tend to tolerate long-term storage better than potatoes such as fingerlings or white and red potatoes. These more delicate-skinned potatoes should be stored the same way, but won't last as long. Onions need a well-ventilated space for storage. The refrigerator is too cold and confined; their crisp texture will become soft and they may "flavor" nearby ingredients. A place that is cool with little to no humidity is optimal; look for a basement, garage, root cellar or dark, cool cupboard. Onions' gas may not only affect potatoes but also any other produce that they're stored next to -- so keep them separate from most other vegetables. 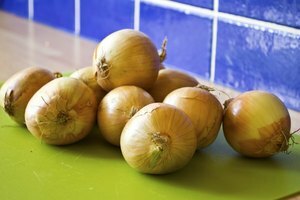 Before storing onions, make sure they've been "cured" -- meaning that their skin has been dried after lying in a warm, dry place. When you do store the onions, a mesh bag or a clean and dry wooden box is best -- keep them in a single layer and don't wash them before storage. White, yellow and red onions can all be stored in the same way; scallions or green onions must be refrigerated and eaten within a week. Garlic may be stored next to onions without over-ripening. Fresh garlic must also be given time for the skins to dry before putting it into long-term storage. Any with soft spots or sprouts should be eaten immediately or discarded. Just as with onions, keep them in a cool, dry and dark space in a single layer. Onions and garlic will last in storage for three to six months, provided the environment is adequately dry and cool and the temperature is relatively stable. Uneven temperature can cause produce to spoil more quickly. 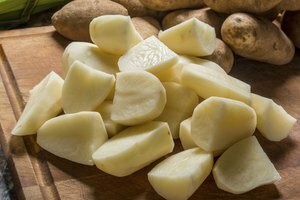 Properly stored potatoes can last in storage several months. If you're storing purchased produce, it's hard to know exactly how long it will last because you don't know how long it's been stored prior to your purchase due to transportation and stocking. Typically, storage of these vegetables happens in the winter -- to get you through until summer -- so you do have an option of a cooler space. If you don't have the luxury of a root cellar or garage that's perpetually cool, opt for the coolest place you can find that isn't the refrigerator. This might be the back of a dark cabinet or cupboard. If you live in a warm environment or climate, though, you may be better off purchasing potatoes, onions and garlic as you need them, rather than trying to store bulk quantities.